Background Patients with high blood pressure (hypertension) in the community frequently fail to meet treatment goals: a condition labelled as ‘uncontrolled’ hypertension. The optimal way to organise and deliver care to hypertensive patients has not been clearly identified. Aim To determine the effectiveness of interventions to improve control of blood pressure in patients with hypertension. Design of study Systematic review of randomised controlled trials. Setting Primary and ambulatory care. Method Interventions were categorised as following: self-monitoring; educational interventions directed to the patient; educational interventions directed to the health professional; health professional- (nurse or pharmacist) led care; organisational interventions that aimed to improve the delivery of care; and appointment reminder systems. Outcomes assessed were mean systolic and diastolic blood pressure, control of blood pressure and proportion of patients followed up at clinic. Results Seventy-two RCTs met the inclusion criteria. The trials showed a wide variety of methodological quality. Self-monitoring was associated with net reductions in systolic blood pressure (weighted mean difference [WMD] −2.5mmHg, 95%CI = −3.7 to −1.3 mmHg) and diastolic blood pressure (WMD −1.8mmHg, 95%CI = −2.4 to −1.2 mmHg). An organised system of regular review allied to vigorous antihypertensive drug therapy was shown to reduce blood pressure and all-cause mortality in a single large randomised controlled trial. Conclusion Antihypertensive drug therapy should be implemented by means of a vigorous stepped care approach when patients do not reach target blood pressure levels. Self-monitoring is a useful adjunct to care while reminder systems and nurse/pharmacist -led care require further evaluation. Use of self-monitoring of blood pressure by patients and professionals has gained popularity and is now recommended in particular patients in certain national and international guidelines; a recent meta-analysis of randomised trials on the subject did suggested a benefit in terms of mean blood pressure and blood pressure control.5 This systematic review aims to update and build upon previous reviews,6,7 by summarising the evidence from randomised controlled trials (RCTs) that evaluate non-pharmacological interventions to improve the management of hypertension in primary care. The majority of patients with hypertension who take blood pressure medication fail to reach treatment goals. There is a strong evidence base for the benefits of antihypertensive drug therapy, but there is a lack of clarity on how to organise and deliver care for patients with hypertension in the community. This systematic review of 72 randomised controlled trials shows that self-monitoring leads to a significant decline in systolic and diastolic blood pressure and, as such, may be a useful adjunct to care and is likely to lead to a reduction in cardiovascular events. An organised system of regular review allied to vigorous antihypertensive drug therapy was shown to reduce blood pressure and allcause mortality. Nurse- or pharmacist-led care and appointment-reminder systems may be a promising way of improving blood pressure control, but require further evaluation. The outcomes assessed were mean systolic and diastolic blood pressure, control of blood pressure, and the proportion of patients followed up at clinic. Original RCTs were identified by an all-language search in February 2008 of all articles (any year) in the Cochrane Controlled Trials Register and Medline (search strategy shown in Appendix 1); articles dated from January 1980 were searched on Embase. Included studies had to be RCTs with a contemporaneous control group, where patient care in the intervention group(s) was compared with either no intervention or usual care. The effects on blood pressure outcomes of the six pre-defined intervention categories outlined above were examined. For the outcomes of mean systolic and diastolic blood pressure, pressure differences from baseline to final follow-up in the intervention and control groups were compared and pooled using the weighted mean difference approach.7 For the outcomes of blood pressure control and clinic attendance at follow-up, statistical and clinical significance was evaluated by means of estimating odds ratios (ORs) with 95% confidence intervals (CIs). Individual study definitions of control of blood pressure and attendance at clinic were used. For both continuous and categorical outcomes, the meta-analyses for heterogeneity were checked by visual inspection and by Cochran's C test. Pooled ORs and their 95% CIs were calculated with The Cochrane Collaboration RevMan software (version 5.02). The flow of studies through the stages of the systematic review is shown in Figure 1. A total of 72 trials were included in this systematic review (Characteristics of included randomized controlled trials are described in Appendix 2). The reported methodological quality of included studies was generally poor to moderate. The randomisation process was described in 30 (42%) of the 72 trials included, while only 14 (19%) had adequate allocation concealment. In 15 studies (21%), the outcome assessors were blind to the treatment allocation and losses to follow-up of 20% or more occurred in 18 (25%) of studies. Flow chart for studies through stages of systematic review. The impact of interventions is summarised in Table 1 (full data available from authors). There was substantial heterogeneity for several interventions and outcomes. In these situations, pooled data are not reported but the range of results from individual RCTs are presented. With regard to self-monitoring (n = 18 RCTs), pooled data from 12 RCTs that reported on differences in mean systolic blood pressure8–19 showed that self-monitoring was associated with a significant reduction of −2.5 mmHg (95% CI = −3.7 to −1.3 mmHg). Pooled data from 14 RCTs on difference of mean diastolic blood pressure,9–22 showed that self-monitoring was associated with a reduction of −1.8 mmHg (95% CI = −2.4 to −1.2 mmHg). In the six RCTs that reported on control of blood pressure,10,12,18,22–24 there was no significant improvement in blood pressure control seen (OR 1.0, 95% CI = 0.8 to 1.2). Educational interventions directed to the patient involved 20 RCTs. Eleven RCTs reported mean difference systolic blood pressure,25–35 13 RCTs reported mean difference diastolic blood pressure,25–38 and seven reported blood pressure control.22,23,30,32,33,39,40 For mean difference in systolic blood pressure and diastolic blood pressure outcomes, pooling of results from individual RCTs produced substantial heterogeneity, so pooled mean differences are not valid. The reported mean difference in systolic blood pressure ranged from −16 mmHg to 1 mmHg, and from −9 mmHg to 7 mmHg for mean difference in diastolic blood pressure. In terms of blood pressure control, there was a trend towards improved blood pressure control and this was significant (OR 0.83; 95% CI = 0.75 to 0.91). Educational interventions directed towards the physician (n = 10 RCTs)30,41–49 were not associated with a significant decrease in mean systolic blood pressure or diastolic blood pressure; control of blood pressure produced heterogeneous results (OR ranged from 0.8 to 1.1). For nurse- or pharmacist-led care (n = 12 RCTs),50–61 the majority of RCTs were associated with improved blood pressure control. However, for all three outcomes, the pooling of results from individual RCTs produced substantial heterogeneity, so pooled mean differences may not be valid. The range of mean difference was from −13 mmHg to 0 mmHg in mean systolic blood pressure (n = 10 RCTs) and from −8 mmHg to 0 mmHg for diastolic blood pressure (n = 12 RCTs); control of blood pressure (n = six RCTs) produced ORs ranging from 0.1 to 0.9. Organisational interventions that aimed to improve the delivery of care were described in nine RCTs.40,41,60–69 For all three outcomes, pooling of results from individual RCTs produced heterogeneous results, so pooled mean differences may not be valid. Of note, the largest RCT, the Hypertension Detection and Follow–Up Program (HDFP),64 produced substantial reductions in systolic blood pressure and diastolic blood pressure across the three groups (weighted mean difference −8.2/−4.2 mmHg, −11.7/−6.5 mmHg, −10.6/−7.6 mmHg for the three strata of entry blood pressure). For appointment-reminder systems (n = 8 RCTs),70–77 the pooled results – although favouring the intervention for follow-up of patients (OR of being lost to follow-up 0.4, 95% CI = 0.3 to 0.5) – are heterogeneous because of the single outlying RCT, and the pooled results should be treated with caution. Pooled data from two small RCTs – one a three-armed study of telephone reminder, mailed reminder, and usual care,76 and the other a parallel study of SMS reminder versus usual care77 – gave heterogeneous results in terms of systolic and diastolic blood pressure, but did show a significant improvement in blood pressure control, OR 0.5 (95% CI = 0.4 to 0.7). In this systematic review, self-monitoring was associated with a significant decline in systolic blood pressure (−2.5 mmHg) and diastolic blood pressure (−1.8 mmHg). Although this blood pressure reduction does not appear substantial in clinical terms, it would, nonetheless, appear to be a useful adjunct to care and is likely to lead to a reduction in mortality and cardiovascular events. This appears to be confirmed in the HDFP study65,66 where an organised system of regular review allied to vigorous antihypertensive drug therapy was shown to reduce blood pressure as well as all-cause mortality. At 5-year follow-up, the reductions in blood pressure (∼10 mmHg for systolic blood pressure and 5 mmHg for diastolic blood pressure) seen in this study were associated with a significant reduction in all-cause mortality (6.4% versus 7.8%, absolute risk reduction = 1.4%, numbers needed to treat = 71). Nurse- or pharmacist-led care and appointment-reminder systems may be a promising way of improving blood pressure control, but require further evaluation. This review had several limitations. Several RCTs included patients with hypertension who were treated and untreated and had differential rates of antihypertensive drug prescribing.8,18,47,76 Many RCTs contained multifaceted interventions that did not fit into a single intervention category.40,51,67 Consequently, it has been difficult to attribute how far single elements that make up complex interventions exert their independent effect on blood pressure control. Finally, several of the RCTs did not make any recommendations about the need for adjustment of target blood pressure readings when self-monitoring was the intervention being assessed, nor did they appear to anticipate lower blood pressure readings in the self-monitoring group.16,21,22,24 This may have attenuated the impact of self-monitoring on blood pressure control because of failure to intensify treatment. Self-monitoring of blood pressure by patients and blood pressure management by allied healthcare professionals both require further development and evaluation in larger RCTs and prospective studies, including cardiovascular outcomes. This systematic review does, however, confirm that the most effective way to manage hypertension in the community is through a structured approach combining systematic identification and follow-up, which will include patient self-monitoring allied with appropriate treatment with antihypertensive medications. We are very grateful to Margaret Burke (Cochrane Heart Group) for help with searching and to Shah Ibrahim who was an author on the original review. Our thanks also to Alison Blenkinsopp, Barry Carter, Sandy Logan, Frank Sullivan, Hayden Bosworth, Brian Haynes, David Jewell, Jim Krieger, Richard McManus, Steven Ornstein, Mike Phelan, Mary Rogers, Lin Song, Kelly Zarnke and Peter Whincup concerning clarification about individual RCTs and providing additional data. Thanks to Craig Ramsay for advice concerning factorial trials. We are grateful to Curt Furberg for facilitating contact with the investigators of US-based studies. Our particular thanks to Charlie Ford for information regarding the Hypertension Detection and Follow-Up Program (HDFP) study. Lastly, we are grateful to Debbie Farrell for administrative support. This study was supported by a Cochrane Fellowship awarded to the lead author by the Health Research Board of Ireland through competitive peer review. Revision received April 14, 2010. (2002) Age-specific relevance of usual blood pressure to vascular mortality: a meta-analysis of individual data for one million adults in 61 prospective studies. Lancet 360(9349):1903–1913. (2001) Control of hypertension – an important national priority. N Engl J Med 345(7):534–535. (2002) Blood pressure control and the implementation of guidelines in clinical practice: can we fill the gap? J Hypertens 20(7):1251–1253. (1972) Hypertension: a community problem. Am J Med 52(5):653–663. (2004) Blood pressure control by home monitoring: meta-analysis of randomised trials. BMJ 329(7458):145. (1998) Detection, adherence and control of hypertension for the prevention of stroke: a systematic review. Health Technol Assess 2(11):i–iv, 1–78. (2005) Educational and organisational interventions used to improve the management of hypertension in primary care: a systematic review. Br J Gen Pract 55(520):875–882. (2008) in Cochrane Handbook for Systematic Reviews of Interventions Version 5.0.1 (updated September 2008) Chapter 8: Assessing risk of bias in included studies, eds Higgins JPT, Green S, The Cochrane Collaboration. (1991) Home blood pressure monitoring for mild hypertensives. Public Health Rep 106(1):85–89. (2004) Nurse management for hypertension. A systems approach. Am J Hypertens 17(10):921–927. (2001) Effects of home telemonitoring and community-based monitoring on blood pressure control in urban African Americans: a pilot study. Heart Lung 30(3):191–199. (2001) Home monitoring service improves mean arterial pressure in patients with essential hypertension: a randomized controlled trial. Ann Intern Med 134(11):1024–1032. (1996) A telecommunications system for monitoring and counseling patients with hypertension. Impact on medication adherence and blood pressure control. Am J Hypertens 9(4 Pt 1):285–292. (2005) Self-monitoring of blood pressure promotes achievement of blood pressure target in primary health care. Am J Hypertens 18(11):1415–1420. (2005) Targets and self monitoring in hypertension: randomised controlled trial and cost effectiveness analysis. BMJ 331(7515):493. (1975) The effects of self-monitoring by patients on the control of hypertension. Am J Med Sci 269(1):69–73. (1992) Home blood pressure monitoring. Effect on use of medical services and medical care costs. Med Care 30(9):855–865. (1998) Antihypertensive drug treatment: a comparison of usual care with self blood pressure measurement. J Hum Hypertens 13(2):147–150. (2000) Effect of pharmacist intervention and initiation of home blood pressure monitoring in patients with uncontrolled hypertension. Pharmacotherapy 20(11):1384–1389. (2000) Influence of self-measurement of blood pressure on the responder rate in hypertensive patients treated with losartan: results of the SVATCH study. J Hum Hypertens 14:235–241. (1976) Improvement of medication compliance in uncontrolled hypertension. Lancet 1(7972):1265–1268. (1978) Self-recording of blood pressure in the management of hypertension. Can Med Assoc J 119(9):1034–1039. (1984) A controlled trial of health education in the physician's office. Prev Med 13(2):185–194. (1982) The effects of family involvement and practitioner home visits on the control of hypertension. Am J Pub Health 72(10):1146–1154. (2005) [Effectiveness of self-measurement of blood pressure in patients with hypertension: the Dioampa study] Aten Primaria 35(5):233–237. (1997) A randomized study comparing a patient-directed hypertension management strategy with usual office-based care. Am J Hypertension 10:58–67. (1995) Use of a standardized personal medical record by patients with hypertension: a randomized controlled prospective trial. MD Comput 12(1):31–35. (1986) Evaluation of an interdisciplinary compliance service for elderly hypertensives. J Geriatr Drug Ther 1(2):23–51. (2006) Randomized controlled trial on lifestyle modification in hypertensive patients. West J Nurs Res 28(2):190–209. (1994) Evaluation of the IMPACT blood pressure program. J Occup Med 36(7):743–746. (2006) Effectiveness of a two-part educational intervention to improve hypertension control: a cluster-randomized trial. Pharmacotherapy 26(9):1342–1347. (2004) Impact of educational mailing on the blood pressure of primary care patients with mild hypertension. J Gen Intern Med 19(9):925–930. (2006) Impact on hypertension control of a patient-held guideline: a randomised controlled trial. Br J Gen Pract 56(532):842–847. (1993) Evaluation of a structured treatment and teaching programme on hypertension in general practice. Clin Exp Hypertens 15(1):125–142. (1991) The impact of a patient education programme in the control of hypertension. J Hum Hypertens 5(5):437–441. (1987) A randomized controlled trial of an information booklet for hypertensive patients in general practice. J R Coll Gen Pract 37(305):548–550. (1982) Improving hypertension control in a private medical practice. Arch Intern Med 142(2):297–299. (1981) The effect of instruction on control of blood pressure in individuals with essential hypertension. J Adv Nurs 6(2):99–106. (1980) Effectiveness of patient education and psychosocial counseling in promoting compliance and control among hypertensive patients. J Fam Pract 10(6):1047–1055. (1983) Five-year blood pressure control and mortality following health education for hypertensive patients. Am J Public Health 73(2):153–162. (1975) Randomised clinical trial of strategies for improving medication compliance in primary hypertension. Lancet 1(7918):1205–1207. (1981) Improving hypertension control: impact of computer feedback and physician education. Med Care 19(8):843–854. (1977) Treatment of hypertension by computer and physician – a prospective controlled study. J Chronic Dis 30(2):81–92. (1986) Does a mailed continuing education program improve physician performance? Results of a randomized trial in antihypertensive care. JAMA 255(4):501–504. (1999) Implementing clinical guidelines in the treatment of hypertension in general practice. Evaluation of patient outcome related to implementation of a computer-based clinical decision support system. Scand J Prim Health Care 17(1):35–40. (1986) Randomised controlled trial of computer assisted management of hypertension in primary care. Br Med J (Clin Res Ed) 293(6548):670–674. (2000) Evaluation of a computer-based clinical decision support system and chart guidelines in the management of hypertension in primary care: a randomised controlled trial. BMJ 320(7236):686–690. 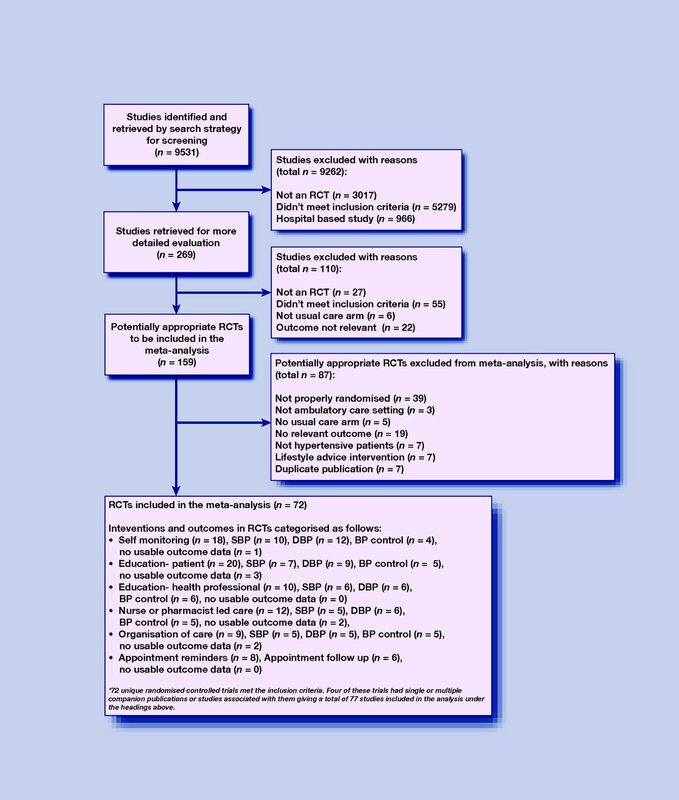 (2004) A multimethod quality improvement intervention to improve preventive cardiovascular care: a cluster randomized trial. Ann Intern Med 141(7):523–532. (2004) Educational outreach in diabetes to encourage practice nurses to use primary care hypertension and hyperlipidaemia guidelines (EDEN): a randomized controlled trial. Diabet Med 21(6):599–603. (2002) Improving blood pressure control in diabetes: limitations of a clinical reminder in influencing physician behaviour. J Contin Edu Health Prof 22(1):23–32. (1998) Comparing standard care with a physician and pharmacist team approach for uncontrolled hypertension. J Gen Intern Med 13(11):740–745. (2001) Pragmatic randomized trial of home visits by a nurse to elderly people with hypertension in Mexico. Int J Epidemiol 30(6):1485–1491. (1979) Evaluation of a clinical pharmacist in caring for hypertensive and diabetic patients. Am J Hosp Pharm 36(10):1321–1325. (1988) Evaluation of a nurse-run hypertension clinic in general practice. Practitioner 232(1447):484–487. (1979) Work-site treatment of hypertension by specially trained nurses. A controlled trial. Lancet 2(8153):1175–1178. (1996) Comprehensive pharmaceutical care in the chain setting. J Am Pharm Assoc (Wash) NS36(7):443–451. (1998) Clinical and economic outcomes in the hypertension and COPD arms of a multicenter outcomes study. J Am Pharm Assoc (Wash) 38(5):574–584. (2006) Pharmaceutical care program for patients with uncontrolled hypertension. Report of a double–blind clinical trial with ambulatory blood pressure monitoring. Am J Hypertens 19(5):528–533. (2005) Nurse-led adherence support in hypertension: a randomized controlled trial. Fam Pract 22(2):144–151. (2004) Pharmacist involvement in primary care improves hypertensive patient clinical outcomes. Ann Pharmacother 38(12):2023–2028. (2006) Effect of nurse-directed hypertension treatment among First Nations people with existing hypertension and diabetes mellitus: the Diabetes Risk Evaluation and Microalbuminuria (DREAM 3) randomized controlled trial. CMAJ 174(9):1267–1271. (2007) Effect of nurse counselling on metabolic risk factors in patients with mild hypertension: a randomised controlled trial. Eur J Cardiovasc Nurs 6(2):160–164. (1976) Randomised controlled trial of computer-held medical records in hypertensive patients. Br Med J 1(6011):677–679. (1979) Therapeutic control of blood pressure in the Hypertension Detection and Follow-up Program. Hypertension Detection and Follow-up Program Cooperative Group. Prev Med 8(1):2–13. (1979) Five-year findings of the hypertension detection and follow-up program. I. Reduction in mortality of persons with high blood pressure, including mild hypertension. JAMA 242(23):2562–2571. (1982) The effect of treatment on mortality in ‘mild’ hypertension: results of the hypertension detection and follow-up program. N Engl J Med 307(16):976–980. (1979) Improving compliance with therapeutic regimens in hypertensive patients in a community health center. Circulation 59(3):540–543. (1983) Screening, treatment and adherence to treatment for hypertension. Scand J Prim Health Care 1(3–4):114–119. (2006) Disease management for hypertension: a pilot cluster randomized trial of 67 Australian general practices. Disease Management and Health Outcomes 14(1):27–35. (2007) Electronic monitoring of adherence as a tool to improve blood pressure control. A randomized controlled trial. Am J Hypertens 20(2):119–125. (1996) A randomized trial to improve follow-up care in severe uncontrolled hypertensives at an inner-city walk-in clinic. J Health Care Poor Underserved 7(4):377–389. (1983) A computer-based monitoring system for follow-up of elevated blood pressure. Med Care 21(4):400–409. (1979) From screening to seeking care: removing obstacles in hypertension control. Prev Med 8(4):500–506. (1985) An appointment reminder system's effect on reducing the number of hypertension patients who drop out from care. Am J Prev Med 1(5):54–60. (1975) Management of hypertension. Effect of improving patient compliance for follow-up care. JAMA 233(3):242–244. (1999) Linking community-based blood pressure measurement to clinical care: a randomized controlled trial of outreach and tracking by community health workers. Am J Public Health 89(6):856–861. (2005) Efficacy of telephone and mail intervention in patient compliance with antihypertensive drugs in hypertension. ETECUM–HTA study. Blood Press 14(3):151–158. (2004) [Effectiveness of an intervention to provide information to patients with hypertension as short text messages and reminders sent to their mobile phone (HTA-Alert)] Aten Primaria 34(8):399–405. (2008) Call to action on use and reimbursement for home blood pressure monitoring: executive summary: a joint scientific statement from the American Heart Association, American Society Of Hypertension, and Preventive Cardiovascular Nurses Association. Hypertension 52(1):10–29. (2002) Physician-related barriers to the effective management of uncontrolled hypertension. Arch Intern Med 162(4):413–420. (2001) Clinical inertia. Ann Intern Med 135(9):825–834.